(Nanowerk Spotlight) The impressive high energy density of a lithium-sulfur (Li-S) battery – employing sulfur as cathode and metallic lithium as anode materials – theoretically can render 3-6 times higher energy density (2600 Wh kg-1) than lithium-ion batteries. "Among various next-generation batteries, Li-S battery is a promising one," says Dr. Qiang Zhang, an associate professor in the Department of Chemical Engineering at Tsinghua University in Beijing. The theoretical energy density of a Li-S cell is 2,600 Wh kg-1, which is much higher than conventional lithium-ion batteries with a theoretical value of 500-800 Wh kg-1. A lithium-sulfur battery commonly uses liquid electrolytes, in which both sulfur and the final product, lithium sulfide, remain solid state whereas the intermediates – polysulfides that consist of two lithium ions linked by a sulfur chain with different lengths – are highly soluble in ether electrolyte. 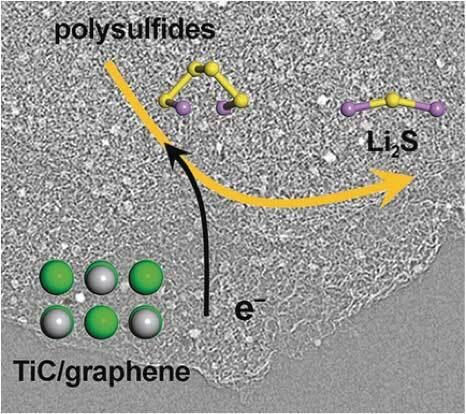 These soluble polysulfides consequently diffuse between the sulfur cathode and lithium anode, following a well-known 'shuttle' mechanism. "The complexity of the multi-electron redox reaction induces the shuttling of soluble polysulfides and drastic structural changes, which greatly impede the complete use of the sulfur in a Li–S cell," Hong-Jie Peng, a graduate student at Tsinghua University, tells Nanowerk, "Ideally, the polysulfides should re-deposit onto the cathode – otherwise about three quarters of the gross energy cannot be delivered. Highly efficient and controllable redox and deposition of polysulfides are very important and require a fundamental understanding of polysulfides’ surface behaviors and related key parameters." Analogous to other electrocatalytic reactions, the redox of polysulfides occurs at the electrode surface and involves heterogeneous phases, making it possible to learn from a catalysis perspective. "Nevertheless, how to regulate the electrocatalysis conversion of polysulfides is a great challenge," Zhang points out. In Zhang’s recent contribution to Angewandte Chemie International Edition ("Enhanced Electrochemical Kinetics on Conductive Polar Mediators for Lithium–Sulfur Batteries"), he and his team explored the role of intrinsic bulk electrical conductivity and surface polarity in the electrocatalysis of polysulfide redox reactions. "We chose three materials with distinct properties to investigate the reaction kinetics on their surfaces," says Ge Zhang, an undergraduate student in Qiang’s group and, together with Peng, co-first author of the paper. "One is graphene, but the perfect graphene crystal is non-polar, making it incompatible to the polar polysulfides. Another one is titanium dioxide, a major component of commercial white paints, which has favorable surface polarity. Unfortunately, it is a semiconductor and unable to allow fast charge transfer." According to the researchers' kinetics study, both graphene and titanium oxide exhibit poor activity to catalyze the electrochemical reactions of polysulfide redox, as well as the subsequent conversion to solid lithium sulfides. "The reason is that these two materials only favor one of the two steps in a complete catalytic process," notes Ge. "Graphene, highly conductive but nonpolar, is unable to adsorb polysulfides efficiently. On the other hand, titanium oxide, poorly conductive but polar, is incapable of transferring electrons generated during the electrochemical reaction. "Then we realized that we have to find a material with both sufficient electrical conductivity and surface polarity," he adds. "Titanium carbide (TiC) is the 'chosen one'." 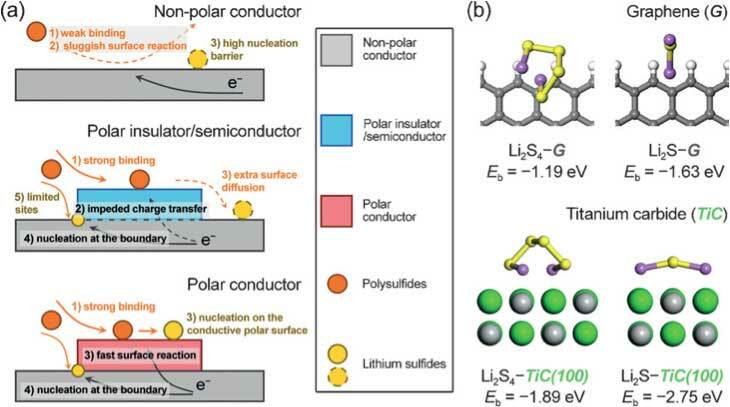 "With this understanding, advanced polar hosts can be rationally designed, leading to high-performance Li–S batteries and other electrochemical devices using multi-electron chemistry," Zhang points out. This exciting result led the team to synthesize highly porous and conductive TiC-based composite cathode materials and to assemble Li-S batteries with high sulfur loading. Li-S cells employing the as-synthesized TiC-based cathode exhibited reduced internal resistance, enhanced energy efficiency, and prolonged service life. "Admittedly, the battery performance is not the best among all the reported results," Zhang concedes. "However, what we mainly focused on in this work was to understand the role of bulk electrical conductivity and surface polarity in the electrocatalysis of polysulfide redox reaction. With such a mechanistic understanding, we are hoping to explore more advanced materials that are both conductive and polar, and to engineer high-performance Li-S batteries."